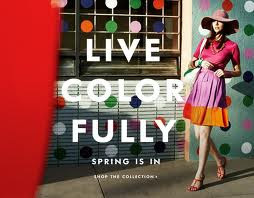 Hello Katie Girl: Live Colorfully! Live colorfully. This is the advice bestowed upon us from designer Kate Spade. Clearly this slogan is meant to be taken both literally and figuratively. The literal interpretation is exemplified by my ensemble which features of rainbow of colors, something like a bag of Skittles. The figurative sense of this phrase is more of a state of mind which Kate Spade explains on some of her merchandise. 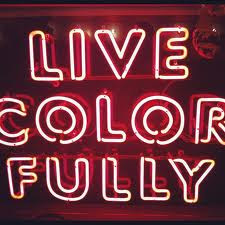 To "Live colorfully" means to "resolve to think outside the lines" or in an itemized list which preaches to "think, travel, celebrate, charm, decorate, live colorfully." Thanks for the sage advice Kate Spade. My skirt today actually is from designer Kate Spade (named Kylie) and Kylie is made out of a boucle type material with various bits of colors sewn in throughout. I have to say I really do love the color palette of Kate Spade. Even in the midst of the bleakest of moods, going into a Kate Spade store automatically brightens your mood with the onslaught of cheery colors and patterns. The neon pink sweater is the collection cable sweater from J. Crew. I know there has been quite a lot of heated debate about the quality (or rather lack of quality) of J. Crew's cashmere, but I ended up paying under $50 for this particular sweater during their "epic" sale a couple of months ago, so I can't complain. Below you will see not only my outfit, but a Kate Spade advertisement and a neon sign with the slogan. (I love neon signs in case you didn't already know.) Live colorfully my friends! Under 50?! Amazing! You wear this so well! Thanks Laura! The sweater is online still, but much more expensive!